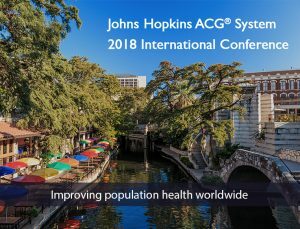 Join the Johns Hopkins ACG System team and meet with hundreds of system users from around the world at the ACG System 2018 International Conference, along the beautiful Riverwalk, in San Antonio, Texas. During this 3-day training conference, you will learn how health care systems and organizations in North America, Latin America, Europe, and Africa are applying the latest risk adjustment and predictive modeling tools to improve population health. A highlight of this year’s conference is the presentation of the biennial Starfield Award, recognizing those who best use the ACG System to address multimorbidity, reduce care disparities and improve population health. Why Attend the Johns Hopkins 2018 ACG System International Conference? Predictive modeling and risk adjustment are taking center stage as key health reforms are being implemented. The Johns Hopkins ACG System has been impacting population health research and practice for more than 30 years. ACG System users are among the leaders in the application of predictive modeling and risk adjustment within pilot projects and outcomes evaluation. This conference will provide an opportunity for you to be informed of the latest developments in risk adjustment and predictive modeling.